Game Idea A Week: Giant! In the idea for this week, you are a giant squishing villagers. Choose your role to play in controlling the giant: feet, hands, roar, or brain. Then stomp on the little villagers; crush villagers with your bare hands; freeze them with your bloodcurdling roar; and navigate to reach more villagers to squish. Although there a quite a few games that use the Wii Balance board, most of these are sports-related games. There are not enough games use the Balance board for other functions. In this game, the balance board is used so that the player can squish villagers with their feet. Also, most games on the Wii are purely competitive and every player has the exact same actions available to them. In Giant! players must cooperate together to squish more villagers and each have a unique role in the game. 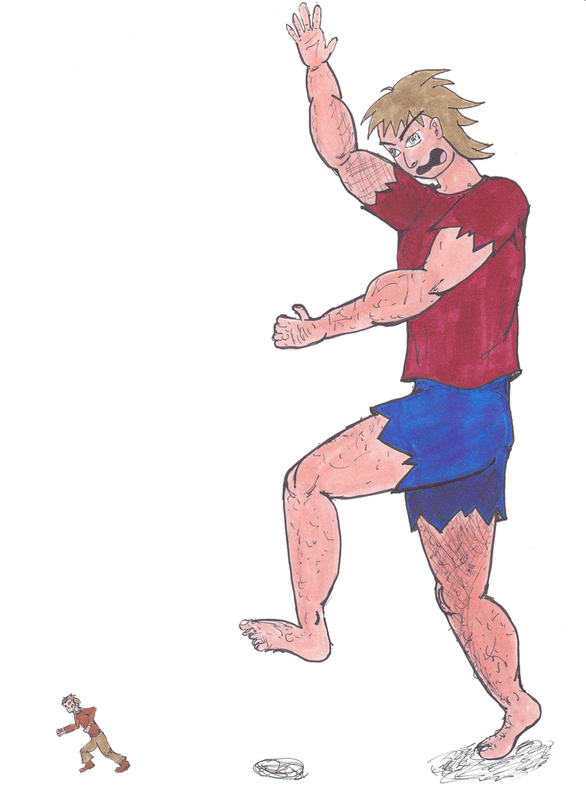 For years Giant has been forced to stay in his cave as the villagers persecute him and taunt him. Finally, Giant decides he won't take it anymore, he wants to come out and show those pesky villagers who is boss. You, the player, help him in his quest by taking control of his feet, hands, roar or brain. Form a team with your friends so that every role is taken and head out to the countryside to find villagers to squish. Brain The brain controls where the giant walks. This should be towards the most villagers. They will pop up on the edge of the screen, and you must quickly choose the direction before a new set of villagers appear. If the brain isn't doing a very good job, there will be less villagers for everyone else to attack. The Wii-mote is used to choose the direction, as though on a wheel directly in front of you. Move the Wii-mote to the chosen direction, where directly in front of you and close in, means go backwards, and in front of you, but far away means move forwards and so on. Press the "A" button to start going in that direction. Mouth The mouth is used to release a blood-curdling roar that will freeze any villager within striking distance. The villager will stay thawed for a while (giving the feet and hands time to crush the villager) then will begin to thaw out. The movement is similar to the brain. The direction is chosen with the Wii-mote and then the Giant will roar when the "A" button is pressed. The current direction of the mouth is shown by where the mouth is pointing (see below). Hands Use the giant's hands to squish the villagers that are close. Keep moving to make sure you kill all the villagers that pop up. Each villager will only be in its position for a short period of time. Move the Wii-mote and nunchuck to move either your left or right hand to the front or to the side. Use the inner and outer circle (see screenshot) to determine whether the hand is close-in or far away. Press the "A" button to squish the villager there. This player will end up pushing their hands out, similar to a boxing/dancing game. 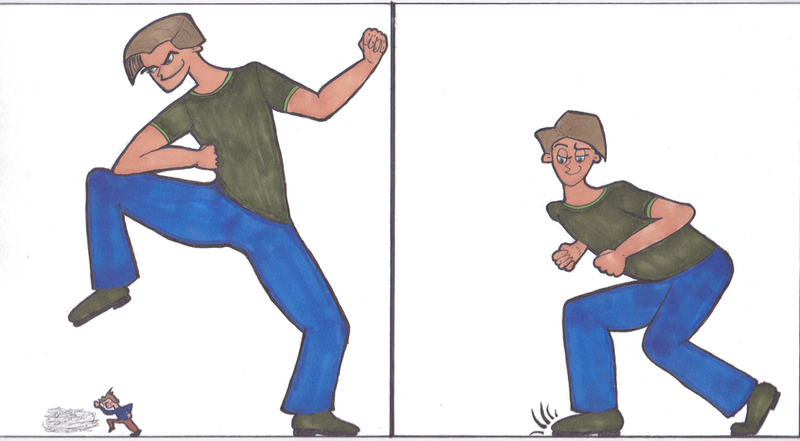 In close - step on the spot on the board with either your left or right foot. Far away - Step off the board to the left or right, keep the other foot on the board. Behind - Step your left or right foot off the board behind you. No balance Board: the game will work similarly how hands work, although backwards will be pushing hands out in front of you. Below is a possible screenshot for the game with four people playing. The pink circle on the outside is used by the brain to direct where the giant heads to next. The head of the giant allows the roar to know which direction they are pointing currently. 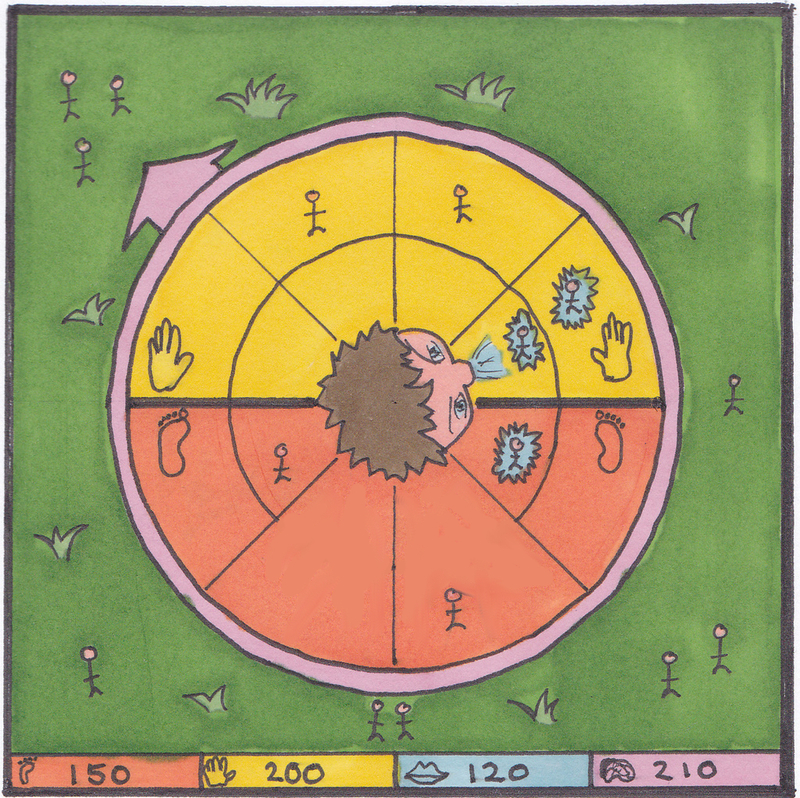 The central circles show whether the villagers are close-in or far away so that villagers in the top (yellow) half can be attacked by the hands, and villagers in the bottom (orange) half can be squished by the feet. Each level will have a single song track as the background music. When the track is over, the level will be over. This will give the feeling that the game is similar to a music/dance game where you have to remember moves and the order that villagers appear. In the solo game, the player can choose which body part to control and will pass each level by getting a specific number of points. In multi-player games, each body part has the same number of points available to them, so that there is no unfair advantage to any of the roles. Players will get a feeling of power over the villagers. They will also be cooperating to squish more villagers. The movements to control each body part will be easy to start using, so that anyone can pick up the game and start playing instantly. For a given level, the villagers will always appear in the same locations. This means, that if people play the game enough, they will be able to use body memory to remember where to squish villagers and will get better at it, similar to the way that repeating a dancing/music game will be still be fun. Players will be unlikely to be able to squish all the villagers. This means, that players will want to keep playing to improve their score on the next fun. In order to give the game variety, it is likely that a system of power-ups will be necessary.